You are viewing all posts published for the month of July, 2010. If you still can't find what you are looking for, try searching using the form at the right upper corner of the page. Episode 10, recorded yesterday Friday 30th July 2010. A round-table discussion of the latest news and topics of debate surrounding the Lotus brand, with a particular focus on IBM WebSphere Portal and Project Northstar this week. Brian Chaput – Offering Manager, IBM WebSphere Portal – Brian is an Offering Manager for IBM WebSphere Portal with over 20 years of technical product marketing and management experience. Prior to joining IBM, Brian was employed at Bowstreet – which was acquired by IBM in 2005 (for its Portlet Factory software). While at Bowstreet, Brian held positions in product marketing, sales operations and lastly as the IBM Alliance Director. Brian has previous experience marketing workforce management and call center management solutions (WebSphere Portal Blog). This podcast is 58MB and runs for 63 minutes at 128kps. Enjoy! Darren: If you are thinking of producing a podcast, seriously consider NOT doing it on a PC. Episode 9 recorded Friday 23rd July 2010. 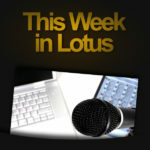 A roundtable discussion of the latest news and topics of debate surrounding the Lotus brand. Darren Duke and Lisa Duke. This podcast is 57MB and runs for 63 minutes at 128kps. Enjoy! Our eighth episode, recorded yesterday (Friday 16 July 2010). A round-table discussion of the latest news and topics of debate surrounding the Lotus brand, with a particular focus on Lotus Connections and social software this week. Sharon Bellamy (Twitter | Blog) Update: Lovely photo of Sharon preparing to record the podcast! This podcast is 63MB and runs for 68 minutes at 128kps. Enjoy! Why should organisations be interested in who is the market leader? What is Connections’ value proposition (and is this changing with time)? Who do Chris/Mac see as the main competitors? Sharepoint 2010 is with us… Making any inroads? How will IBM address external collaboration with the Lotus portfolio? IBM doesn’t rank on Gartner’s “Externally facing Social Software” quadrant (led by Jive, Lithium, MS and Telligent). What is IBM doing in this area? Will Connections allow internal and external social collaboration in the future? Extranet license – has this been successful? Are many organisations using it? Why have we chosen to do this? What benefits do these technologies have or us, over say, Sharepoint? Connections is seen as being very complex, is this really the case? What are the opportunities for partners when working with Connections and Quickr? What do organisations gain from using Social computing such as Quickr and Connections? Get comments that Connections (and to some extent Quickr) can create ‘messy’ collaboration – how can organisations (and Connections admins) control this? Comments from Adam on type of customer’s/organisations showing interest and taking up Connections in Australia. What is coming in the next release? Anyone wearing Old Spice today? Adam: We have just released today WildFire 1.4 on OpenNTF. Now supports Mac & Linux as well as a few new features. Chris: Don’t try to makeup new metrics to measure ROI on social software, use your existing business measures. Stuart: Public skype chats for Connections and Quickr – contact me to be added!